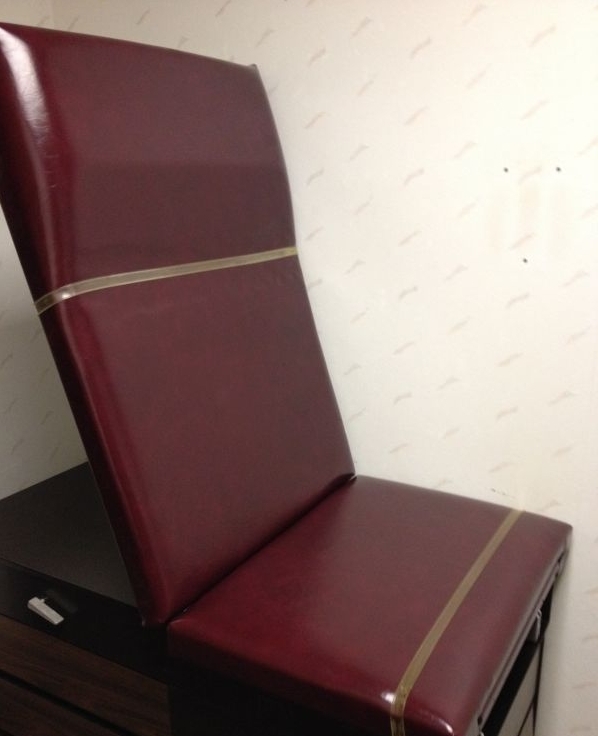 The padded tops of exam, therapy and massage tables get used - often and heavily. Over time, the vinyl or faux leather material wears, cracks and tears. The comfort, appearance and clean-ability of the table pads erode. Recently, the site manager for a physical therapy clinic in New Jersey told us that "The cracks in the vinyl are rough and when we clean the pads, the exposed foam stays wet for the next client. Embarrassing." Part of the problem stems from trying to keep healthcare style equipment ... healthy. Ingredients in antimicrobial cleaning solutions can harden standard PVC vinyls over time. Concentrated alcohols and chlorinated solvents are common culprits. Once the outer vinyl cover hardens, it cracks easily and can peel away from the fabric backing. Adding to the problem are the pressure points generated when the table is used. Knees, elbows and butts press downward on the brittle vinyl. Beneath, the foam is flexible and yields, but the hardened vinyl cannot stretch enough to flex with the foam - and it cracks. Corners, edges and stitch lines are common failure points. I don't want to guess what happened to the material in the cover photo up there - maybe a glancing blow from a light saber or some such. Duct tape as a stop-gap repair works in the short term. But, embarrassing after a while. 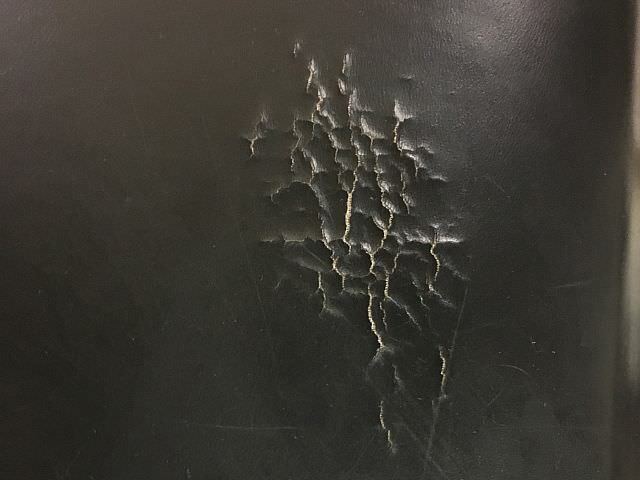 Reupholstery of this exam table in Marlton, NJ was more affordable than replacing the table or buying replacement pads from the manufacturer. The upholstery labor was $380. And two yards of a durable engineered vinyl substitute cost $142. Out on Friday and back on Monday morning. That is a lot of duct tape, but far less embarrassing. $380 is a fairly typical reupholstery price for exam and therapy table pads where the foam padding is still intact. Flat one-piece pads are typically $300. Large two-part tables or those with a facial cut-out (massage style) are $380. Usually 2 to 2 1/2 yards of material covers most tables. These reupholstered tables from LourdesCare Cherry Hill used 2 1/2 yards each. They were done in a synthetic faux leather material from Majilite called NYTEK. Rather than a PVC outer covering over a woven base substrate the NYTEK uses non-woven carbon microfiber matrix to form the base and an outer finishing process superior to PVC. Wanting real world proof of the tech-sheet statistics for the fabric, we made a video of our shop tests of two common complaints about vinyl - punctures and tears. It is a bit more expensive than conventional premium vinyls. Most medical and therapy clinics can't afford to be without their equipment for very long. Downtime is at a minimum. Arrange to work the tables during days when the office is closed when possible. Typically weekends. We pick up the table pads on Friday evening and return them before the next open hours. Reupholster the tables in stages so no more than a certain number of percentage are missing at any one time. These materials and methods keep your healthcare equipment looking and feeling good. And clean. Without a lot of interruption and extra expense. If you have questions or specifics about recovering some of your equipment, feel free to contact us. The upholstery shop of JH Conklin & Co. reupholsters furniture for people and businesses throughout Southern New Jersey, Delaware, Philadelphia metro and the southern shore areas. The workshop also provides custom Roman shades and fabric resources.